Hello 2017 and hello Food 'n Flix Clubbers! 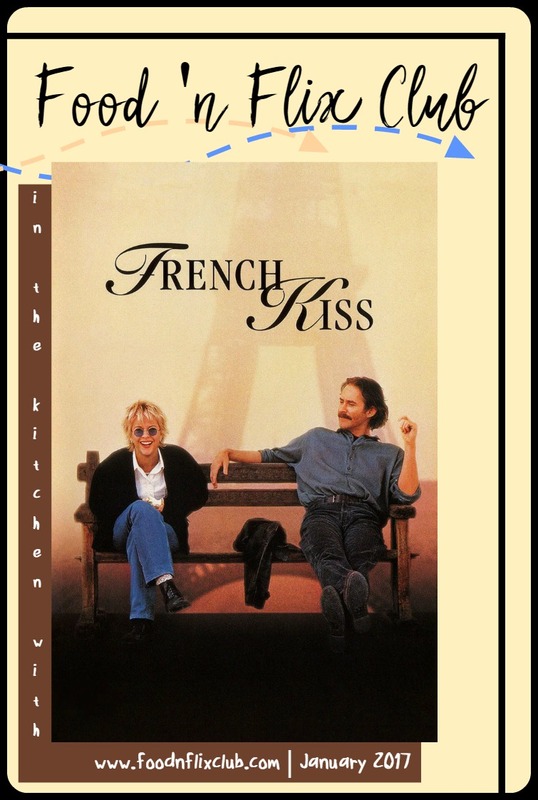 I'm excited to be kicking off yet another year of movie inspired food with something fun and light, one of my all-time favorite rom-coms, the 1995 flick, French Kiss! You've probably noticed that this post is a bit more than my regular monthly announcement, and that's because I thought it would be fun to host right here at home base every once in a while. Once in Paris, Kate sets her mind to winning back Charlie, and Luc sets his mind to retrieving his stashed goods. Romance and comedy ensue. Plus, the majority is actually filmed in France, so there's some beautiful scenery. This isn't a particularly food-heavy film, but there are a few scenes that will offer obvious inspiration, and hopefully a whole movies worth of ideas to draw from (location, location, location!). I can't wait to see what everybody comes up with this month. If you're a blogger or have an instagram account, you are welcome to join us! Watch French Kiss. Taking inspiration from the film, head into the kitchen and cook or bake or make something. Post about it on your blog with a link back to THIS POST. Use of the logo is optional (but you can grab the code here to insert it easily into your post if you'd like to use it). Alternately, post a photo of the dish you made on Instagram (public accounts only). You must include the following in your caption: short intro, recipe, #FoodnFlix and tag me (@roadstokitchen). CLICK HERE TO SEE OUR FRENCH KISS MENU! Frank and I spent our NYE rewatching this movie. Thanks Heather....I've got my inspired post coming up in the next week or so. Happy New Year! Glad you're hosting here, Heather. I have never seen this film and am looking forward to it.